Review posted January 16, 2019. Greenwillow Books (HarperCollins), 2016. 32 pages. 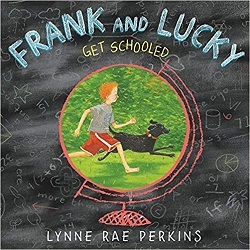 Frank and Lucky Get Schooled is a story about a boy and his dog – and how everything a boy and his dog do together is educational. That doesn’t sound as charming as it is. I’ll give some examples. Imagine detailed and bright pictures with word bubbles for Lucky’s thoughts. Lucky could always help Frank with his homework, because Lucky did a lot of learning on his own. For example, Lucky was very interested in Science. Who isn’t? Science is when you wonder about something, so you observe it and ask questions about it and try to understand it. He wondered about squirrels and deer and bees and porcupines and little birds. He observed snow and rain, mud and grass, ponds and streams. He asked questions…. The time Lucky wondered about skunks, they learned about Chemistry, which is Science about what everything is made of, and how one kind of thing can change into another kind of thing. It’s very fun the way the boy and dog look at different subjects. Math involves what fraction of the bed belongs to Frank and what fraction to Lucky. (It changes throughout the night.) History involves the question of what happened to the cake on the table when a chair was accidentally left pulled out. They look at Art, Composition, Astronomy, Geography, even Foreign Languages when they find a friend. This book is charming all the way along. And the whole wide world with Lucky was the subject Frank liked best.